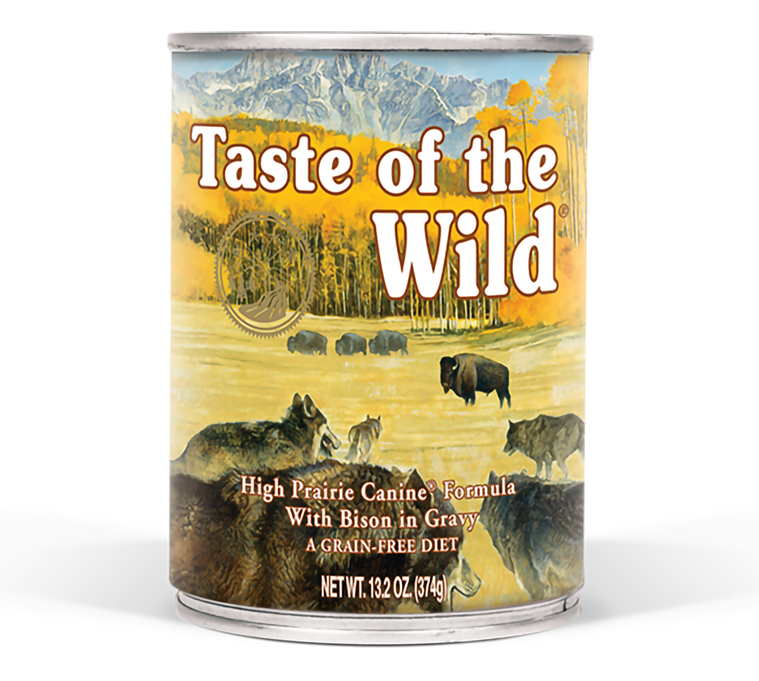 Taste of the Wild High Prairie Canine Formula With Bison in Gravy is formulated to meet the nutritional levels established by the AAFCO Dog Food Nutrient Profiles for growth and maintenance including growth of large size dogs (70 lbs. or more as an adult). High Prairie Canine® Formula with Bison in Gravy is rated 4.9 out of 5 by 11. Rated 5 out of 5 by bk62 from My finicky Husky loves it ! Our dog can be pretty finicky, tried different premiums but she seems to like this and the Wild Boar and Lamb the best. We like the chunks and thick gravy, We mix it with dry food and she really loves it. We feel good feeding her Taste of the Wild. Rated 5 out of 5 by Echo2418 from My German Shepherd Can't get enough! Our German shepherd puppy is almost 10 months and she loves food! We experimented 2 other brands before taste of the wild. After one cup of this stuff she was bouncing off the walls! She is always ready to eat! 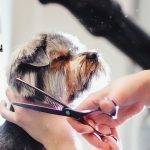 We find that it also helps keep her fur soft and shiny and who doesn't want a soft fur baby? Rated 5 out of 5 by bet105 from No more begging! I was given a can of your dog food and upon feeding it, I noticed at once that my dog and CAT loved it. They usually come around in a few hours wanting to be fed again, not after eating your food. They actually slept though the night! That has NEVER HAPPENED! I will be going shopping to get more and buying the cat HER OWN food. Rated 5 out of 5 by Melsdiner7 from Our oldest won't eat his hard food without it. I started feeding my staffies when I adopted one with a skin condition. Taste of the wild helped clear that up and she is all muscle now. Our oldest dropped weight and I put him on it and in no time (vet was shocked) he gained his weight back. He recently had a mouth tumor and he likes the canned food on top of his hard food. Rated 5 out of 5 by Jim U from My Akita won't eat anything else! 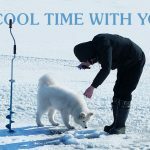 Try it as many as you want but once you get to Taste of the Wild you'll stop because your dog will love it I have had Akitas for many years and they have all loved this food. Rated 4 out of 5 by Dani from We have 6 dogs and they love it! We have 4 Dogue de Bordeauxs, a Pomeranian and a Toy Fox Terrier and this is the only food they all love and eat the their whole meals every time! Rated 5 out of 5 by Pugsley from Otto loves it! Otto has never eaten anything else other than TOTW. Why feed him something else when he's healthy and he loves it! on the feeding chart is it the amount of a 13.2 oz can. or is that cups? Reason for asking is the facts sections talks about cups. so a little confused??? Hi, Lilly. The feeding guide for our canned food refers to the recommend number of cans/day of the food. In this case, 13.2 oz cans of High Prairie. The cups you read about in the FAQ section is in reference to our dry formulas. But thank you for your question &ndash; we will be sure to update our FAQ section and clarify! How much phosphorus is in a can of High Prairie Canine Formula with Bison in Gravy? Denise, the phosphorous content of High Prairie Canine with Bison in Gravy is 0.30% as fed. Hello, thanks for reaching out. Our High Prairie Canine Formula with Bison in Gravy is a great choice for your puppy. It contains bison, lamb and venison for a blend of quality animal protein sources. The feeding recommendation for toy breed adult dogs is &frac14; - 1&frac14; cans per day if feeding canned food only. For puppies, we recommend feeding up to two times the recommended adult feeding amount. As your puppy gets older, gradually decrease the amount to the adult amount. Our dog needs a low sodium diet, but he loves Taste of the Wild canned foods. Can you share how much sodium is in them? Hi, Kari. Our High Prairie Canine Formula with Bison in Gravy contains 0.24% sodium on an as-fed basis. For the sodium content of all our canned foods, please contact our product specialists by visiting https://www.tasteofthewildpetfood.com/#contact-us or calling us at 1-800-342-4808. We have fed this formula in the dry form, twice a day to our dogs. We have realized that our 15yo pug will have to be switched to canned food, due to her having few teeth. She weighs 17lbs and is not very active. How much canned daily should she get? Hello, Carrie. You can feed your pug 1 &frac14; to 2 cans of High Prairie Canine with Bison in Gravy per day. We recommend adjusting the amount you feed based upon her activity levels and whether she maintains or gains weight. Hello and thanks for reaching out! 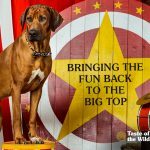 All of our Taste of the Wild canned recipes are formulated for growth and maintenance, and are suitable for puppies. Please note the feeding guide, as puppies require higher amounts than adult dogs. In addition, our two dry puppy recipes would be great options for your puppy! Both our High Prairie Puppy recipe and our Pacific Stream Puppy recipe were developed with the needs of growing puppies in mind. The recipes contain specific nutrients like added DHA that aid in brain and eye development. If you have any questions, please contact us by visiting our website end an e-mail by visiting https://www.tasteofthewildpetfood.com/#contact-us. Do you have an estimate of the copper content in this food? Hi, Sharalee. Our High Prairie Canine Formula with Bison in Gravy contains 12 mg/kg of copper on an as-fed basis. IS you product available to but on line? Hi, Cheryel. Yes, our products are available online. You can find an online retailer at https://www.tasteofthewildpetfood.com/where-to-buy/.